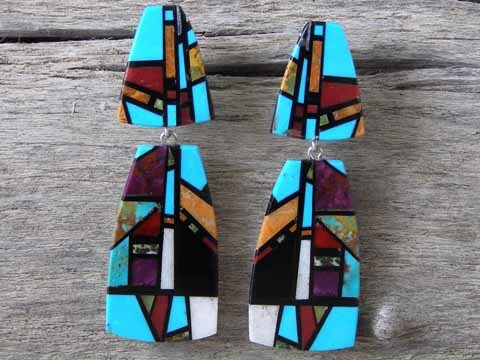 We are always on Chris Nieto's list to receive these earrings on the rare occasions that he makes them. He makes very few of these because of the painstaking process of inlaying smaller pieces with the exacting precision that he requires and making these items match perfectly as a pair. The mosaic tiles are set on a foundation of serpentine and the drops swing freely. CTN for Christopher Thomas Nieto and SDP for Santo Domingo Pueblo incised in the stone on the back of the drops. Dimensions of posts: 3/4" x 5/8"
Dimensions of drops: top to bottom 1 3/8"; widest point 3/4"